This show is now my favouritee TV show; although I haven’t watched the latest episodes yet (I’m just finishing season 5) I do know who the latest A is. I saw this post on Steph’s blog and just knew I had to take part! Aria or Spencer; my mum says I look like Aria because I’m brunette and petite but I think I’m more like Spencer personality-wise- driven, ambitious, studious. 2. Who is your least favourite character? Alison. I know there’s a lot of stuff involved but how do you pretend to be dead for two years?! 3. Who do you ship? I love a romantic kiss in the rain scene. 4. Most memorable cheesy/stupid moment? My favourite funny moment is the episode I’ve literally just watched when Emily and Hanna are dancing in the studio. Bless her, Hanna is so funny! I loved Mona as A but I also have a love/hate relationship with Melissa. I actually love it when she plays evil rather than good! 6. Which girl do you think has been hurt the most by A? All of them have really; Spencer got put in Radley so I guess she’s had it hard. 7. Which girl’s style do you love most? I love all of their styles at some point and they all have some questionable moments but I’d say my style is more like Spencer’s mostly; I like preppy and Blair Waldorf (I know, different show!) with a bit of the others mixed in. My favourite fashion on the show is the funeral fashion. Dress to impress! 8. Which girl do you relate to the most? 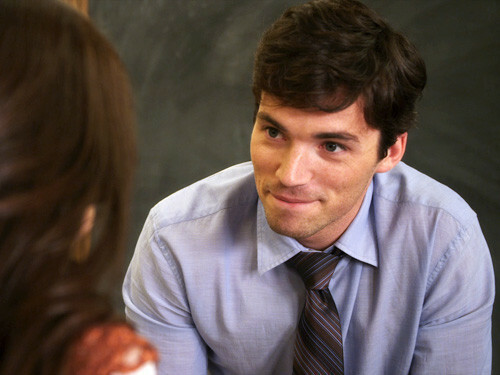 Spencer because of how academic she is but then I am quite creative like Aria. 9. Who’s your crush on the show? Ezra or Noel. Or Caleb. (I like brunettes!) In fact, the majority of the younger guys are good-looking. Plus I have a huuuuge girl crush on Lucy Hale (Aria). I mean, come on. Look at that smile and those eyes! 10. What was the most shocking moment for you? It wasn’t shocking but I nearly crapped my pants when Hanna was being followed by a police car, pulled over and went to look inside it and then Holbrook appeared from nowhere. But let’s face it, there’s a shocking moment in nearly every episode! 11. What would you do if A was after you? I’d report it I’d like to think and run for the hills! 12. What has been your favourite episode so far? My favourite episode was the Halloween episode from season 3 ‘This Is A Dark Ride’, the episode on the train. I love the costumes on it and generally felt scared from Aria when she was kidnapped. Also I love “Team Sparia” in season 2 ‘unmAsked’ when Spencer says to Aria “You’re little, but you’re big”; I like to think I’m like that too! I’ll admit that my favourite thing about PLL is the whole cast. Unlike other shows, you never hear any beef about castmates not liking each other (here’s looking at you, Glee!) because it seems like they are all genuinely really good friends!